In the new issue of integration, Peter Becker covers the negotiation process of the next multiannual financial framework 2021-2027 and underlines the necessity of finding a reliable balance between budgetary predictability on the one hand and political adaptability on the other. Jonas Bornemann discusses the member states’ sovereign choice to reintroduce border controls and the legal framework established by the Schengen acquis, which aims at the abolition of such checks. 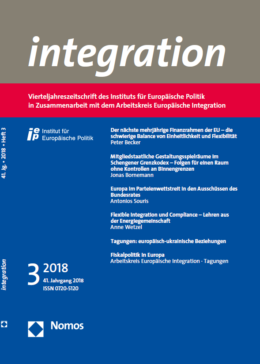 Antonios Souris analyses the federal states’ voting behaviour in the plenary sessions of the Bundesrat regarding European affairs and concludes that partisan considerations of federal states’ governments in European affairs are almost as strongly pronounced as in similar decision-making procedures related to domestic legislation. Anne Wetzel addresses the issue of rule implementation and compliance in models of external differentiated integration based on the example of the Energy Community. The issue contains also a summary of a conference on the relations between the EU and the Ukraine, organized by the Institut für Europäische Politik. The “Arbeitskreis Europäische Integration” reports on the “2018 ZEW Public Finance Conference” about the future of fiscal coordination in Europe. With the proposal for the next multiannual financial framework (MFF) 2021-2027 of 2 May 2018, the European Commission opened a difficult negotiation process that is crucial for the future of the European Union. In addition to the controversy over the volume and allocation of funds, another issue of the MFF negotiations will be important for the further development of the EU. A reliable balance needs to be found between budgetary predictability on the one hand and political adaptability on the other. The objective of improving the EU’s capacity for response through flexibility instruments inside and outside the MFF will have to be brought into line with the budgetary principles of budget unity and completeness. The European Parliament’s budgetary participation and scrutiny rights and thus the democratic legitimacy of the EU budget as a whole must be taken into account properly. Following the so-called refugee crisis, several Schengen states opted for the reintroduction of border controls. The mere fact that such checks were not just appropriate but equally lawful was beyond doubt when the new German federal government took office. Notably, however, the European Parliament agrees. It argues that continuous prolongation of such checks would amount to the abolition of the Schengen area altogether. How do these divergent conceptions come about? Which margins of discretion do member states possess in order to reintroduce border controls in line with European Union law? With a view to the evolution of the Schengen regime, this contribution explores the tensions between member states’ sovereign choice to reintroduce border controls and the legal framework established by the Schengen acquis, which aims at the abolition of such checks. The party politicisation of European integration in the German Bundesrat remains largely in the dark due to the missing documentation of the federal states’ voting behaviour in the plenary sessions. For an empirically informed analysis, this contribution draws on a novel dataset that focuses on the Bundesrat committees where individual votes are registered. The findings reveal that there have been profound partisan considerations of federal states’ governments in European affairs since the early 1990s, being almost as strongly pronounced as in similar decision-making procedures related to domestic legislation.